RTS-League / Forums / New Step for RTS League - AoMT Hybrid Clan Cup Opens! » New Step for RTS League - AoMT Hybrid Clan Cup Opens! New Step for RTS League - AoMT Hybrid Clan Cup Opens! We've been signalling it for some time already, but here it finally is - we're stepping into a new territory, a territory of even more fun for the community than our Clan Leagues already provide. One-time, faster-format (than our standard Leagues - we aim for just several weeks) tournaments have been our long-term goal to let you have some competitive enjoyment even in-between seasons, and to also test some new ways how tournaments could be hosted for the community to break the same-old ways to play. With all that in mind, and also our long-standing history, we chose to have the first event be a Clan Cup, a challenge to all clans beyond our standard Clan League, but this time on non-standard grounds and in non-standard settings so as not to repeat too much of the same. 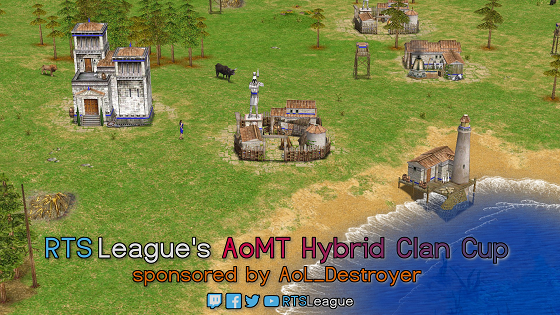 AoMT Hybrid as quite an interesting way to play Age of Mythology combining Vanilla and Titans has been waiting for its proper dedicated tournament for a long time, and after the success of the Age of Mythology / The Titans 1v1 Summer 2018 Championship hosted by AoL_Destroyer, we saw the potential actualised and here we are with a full-fledged edition - aimed at clans as the cornerstone of the community, as is our tradition. Or as you can call it in short "Hybrid Clan Cup," is ready to accept sign-ups from the ranks of real clans that want to taste the thrill of competition looking to determine which clan deserves the honours of being called the best in the current mode of play. We're also looking to get everyone into the groove again, as the standard RTS League's Clan League will follow right after, and there has been a period of pause since the last Season, so we understand it may take a bit to get familiarised with the classic ways to do things again (not only here, but also within the clans). - Format: GSL - Divisions of 4, Double Elimination within, top 2 into Single Elimination Playoffs. - Version of the game: AoMT Hybrid mod created (and updated for the tournament) by ChronoJJ. - Open to: All clans as per our Clan League Rules and conventions. Besides that standard RTS League matters apply, like match a week, play on Main Nicks, Guest Players per Rules, etc. Map pool is also fairly similar (check Rules for the specifics, we made a few adjustments for the mod) and B-teams have a bit of a caveat due to the format. Thank you very much AoL_Destroyer for your contribution. AoMT Hybrid - What Does It Do to the Game? In case you're not familiar with the mod itself, "A Happy Cappuccino Blend of AoM and AoT," as Chrono aptly put it, combines the features of both worlds into one experience - it's basically meant to allow you to play Vanilla within the Titans framework, making it easier for many to enjoy the gameplay without the troubles some have in running the original game. The core ruleset is therefore close to Vanilla gameplay, such as TCs only in Heroic, Greek special units from a Fortress, Docks don't shoot, costs and strengths are generally back to Vanilla levels - yet you can play Atlanteans and you get to enjoy AoT maps, like the ever-popular Marsh. Or Highland. More info can be found either on the mod page or also below the Hybrid Clan Cup Rules. B(C, etc. )-teams need to supply their complete roster with the application as well to allow us to gauge their strength so that we know where to seed them if they're accepted. Please also pay special attention to the guidelines on Guest Players found in Clan League Rule 4 - you need to list them as well to allow us to properly seed the clans. Please sign your clan up only if you seriously want to take part in the Cup, do not sign up inactive or fake clans or clans with too few players to actually meaningfully compete. Clans that drop out during the tournament will have a non-favourable note to them for further competitions that could prevent them from being accepted. Sign-ups will be closed on Sunday 17th February, Hybrid Clan Cup will start the following week. Cannot wait to see how our first Clan Cup goes, hope it's a beginning to a great new tradition And spread the word - the more clans, the more fun for everyone! Re: New Step for RTS League - AoMT Hybrid Clan Cup Opens! Clan Operator has read the rules and agrees to them (and hopefully understands them): Yes, read and understood. Thanks everyone for signing up in the proper term - we know there are a few other clans who learnt about this later and are still discussing things to join, so we will give them a few extra days to sign up - this is an opportunity for everyone else as well, it's not too late yet! Clan Operator has read the rules and agrees to them (and hopefully understands them): Yes sure. To help with activity, F2 is teaming up with AoL; just as F2/AoL, to help with weird timezones for some of F2s players. Thanks everyone for the sign-ups, we have cleared what we needed to and will start the tournament Monday - get prepared! I am forced to log frost clan off the rtsl. we just do not have enough active players for it. Luckily we have had a back-up option ready, so WKT B will replace them as another participant, and that requires a bit of a switch not to have them both in 1 Division - Pandoraboxx will move to Division 1 and TheWalkerTeam B will go to Division 2. Luckily we are at the very beginning of the competition, so we can do this adjustment without any repercussions. Gl&hf and thanks WKT for being able to step in!